My eight year old LOVES to write. It's nothing I've ever taught or asked him to do - he just adores creating stories, writing them, and sharing them with others. One thing I DO know, however, is that LEGO bricks have inspired his creativity in this area. Each week at our Classical Conversations group, Foundations students give a presentation for their class. Two weeks ago, Grant created LEGO stories and read them for his presentation. He put together an entire folder, with stick puppets, minifigures, and stories. Let me share his creation with you, and maybe it will inspire your LEGO lovers to follow suit. At the end of the post I will also offer you a download that will hopefully make writing more fun for your children! Grant put together a "LEGO Story Folder". It's so simple, and it allows him to take elements for his stories wherever he goes! A zip lock bag taped to the inside of the folder with a few favorite minifigures. We have a favorite set of minifigures in our house! Write stories to share with family and friends! Put on your own LEGO drama with story and stick puppets. Keep your LEGO folder in the car in case you need something to keep you busy while you are waiting for a parent or sibling. Keep your LEGO folder by your bed and journal about your minifigure's day. 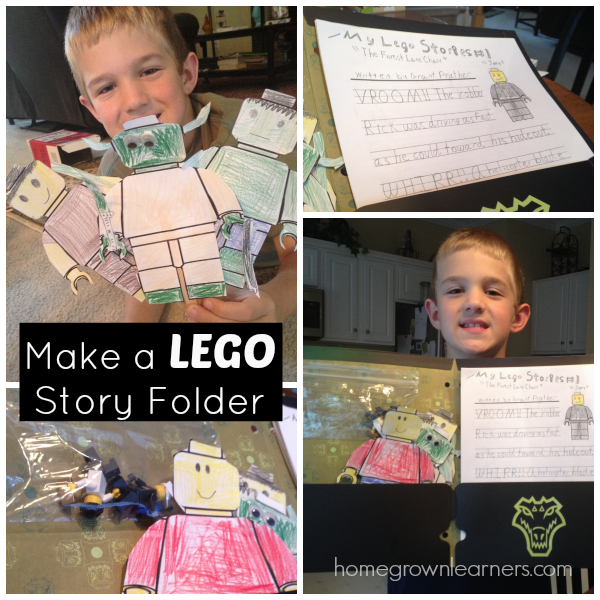 Fill up your whole folder with stories and save them - imagine what fun it would be to tell your OWN children your LEGO stories! BE CREATIVE! What else can you do with your LEGO Stories Folder? Dowload the LEGO Writing Paper, and let the stories begin!